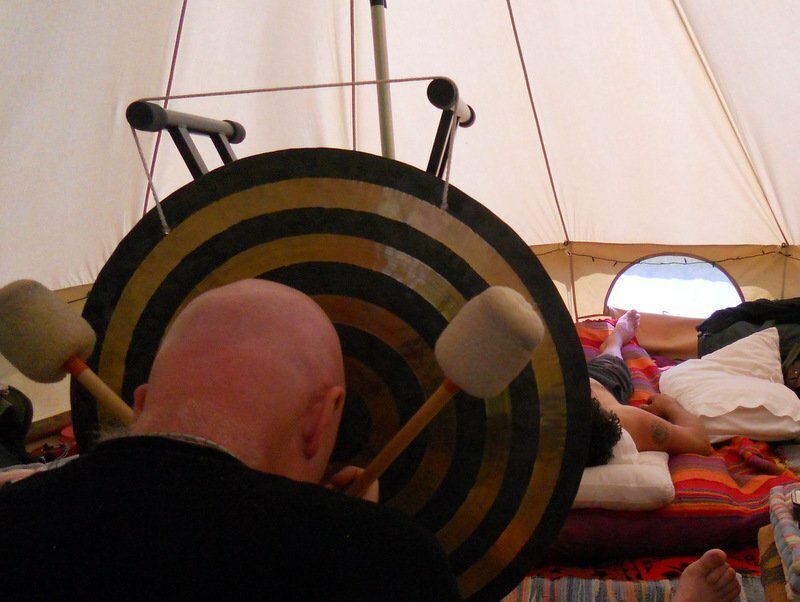 Last weekend’s Moongazy Camp was the biggest and best yet. 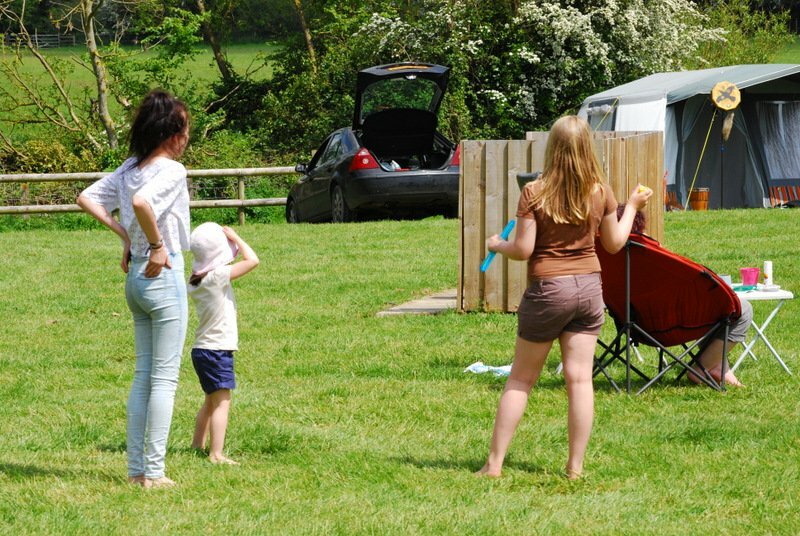 We were blessed with the most glorious hot weather as the sun shone down on us from dawn till dusk. Stonewylde readers gathered from all corners of the land for our annual get-together, which each year becomes more and more friendly and almost tribal. 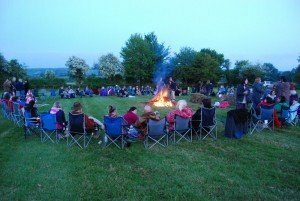 The camp is organised by Swampy, whom I first met seven years ago when the self-published edition of Solstice at Stonewylde, the third book in the series, was launched. He was a shy and blushing lad then, tagging along nervously with his Stonewylde-mad partner who’d come to a book-signing. 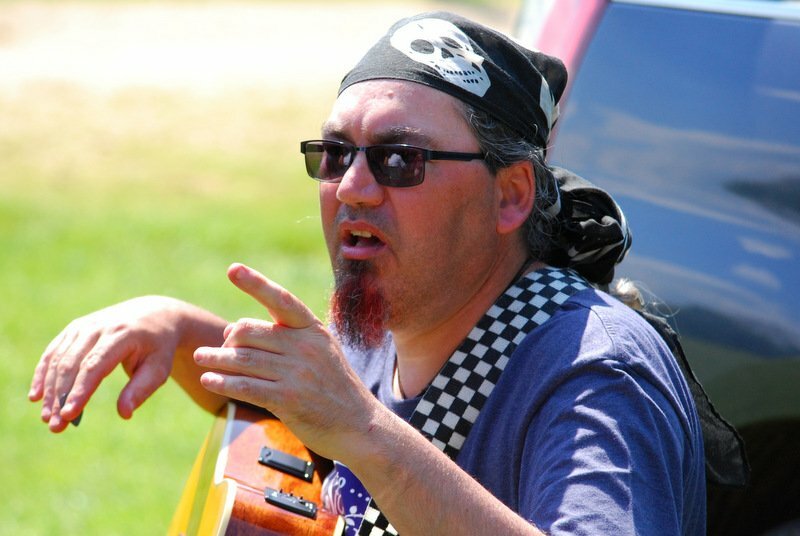 Today he organises the huge rally near Avebury every year, where so many Stonewylde fans meet up amid hugs, laughter and a lot of cake. Moongazy Camp is deliberately low key. 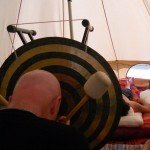 It’s not about workshops or timetables, but all very free and easy. 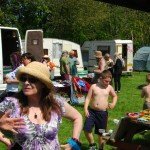 We have a group barbeque, a campfire, jamming sessions, a craft fair selling homemade things, and a lot of chilling out. Some people go into Avebury and West Kennet to spend time amongst the amazing stones and in the long barrow. Others never leave the camp. 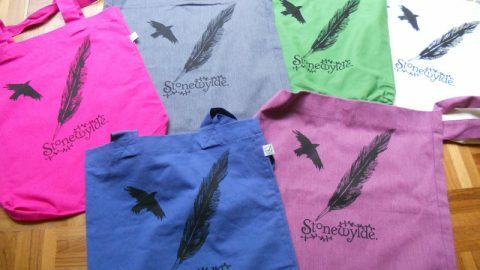 When Mr B created the first Stonewylde forum so many years ago, he started something truly wonderful. 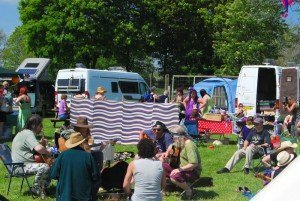 Real friendships have bloomed over the years – from the first tentative meet-up for the day in Avebury, to today’s huge camp. 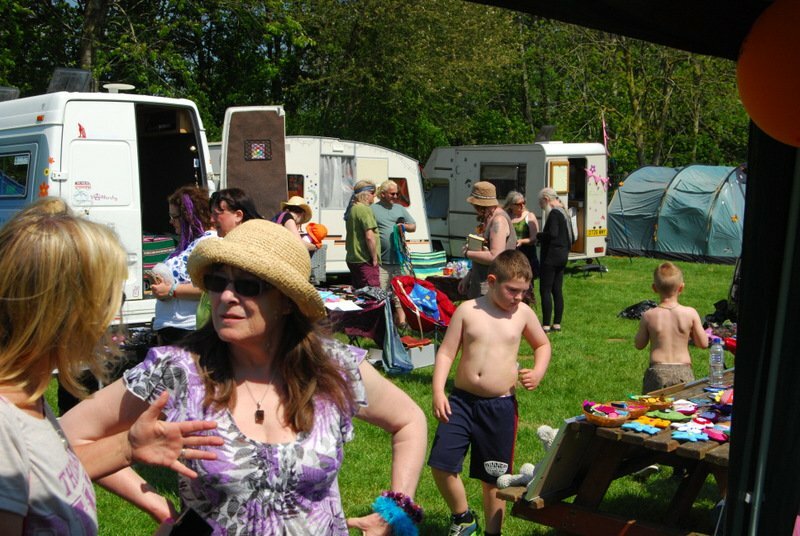 There are also many other more local get-togethers throughout the year. It’s such a long way for people from Yorkshire,Cornwall and Norfolk to come, and yet they do. Several couples are together today because of Stonewylde. They met through the forum and after meeting in real life, have embarked on a live-in relationship! I find this astonishing, but I suppose that if both people love Stonewylde, they already have a great deal in common as the books explore quite deep and fundamental issues. The camp is for people of all ages – I don’t know the age of the oldest person there this year, but the youngest one was only nine months old (and he was wonderful – a gorgeous baby!). 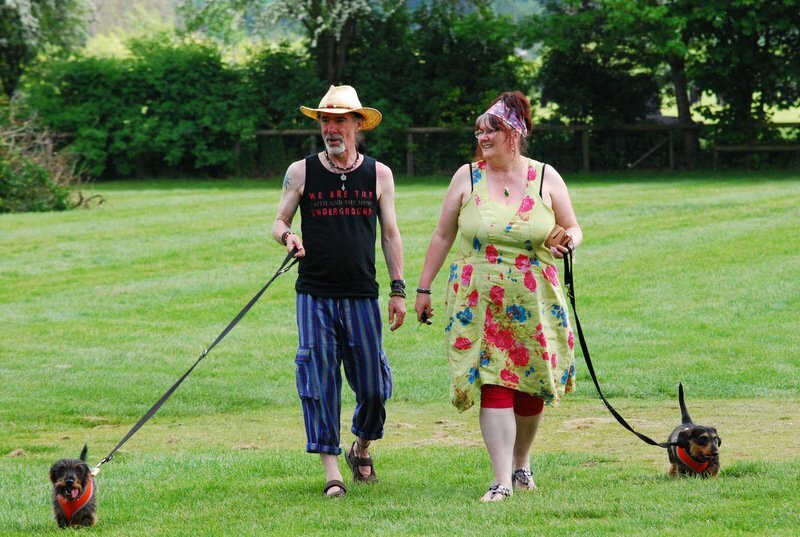 Many people bring along their children and teenagers, who all seem to get along splendidly, as do the many dogs. Drax enjoyed his time very much, and all the fuss made of him. Swampy and Lee set up, each year, the brilliant Solstice Cafe in a gazebo. This cheap phentramin-d provides free tea and coffee for everyone – very helpful if you don’t have an electric hookup. Many Stonewylders bring along cakes to share, and this year the cakes were particularly delicious and abundant. 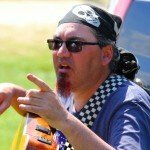 There are many talented musicians amongst us, and even more keen learners. 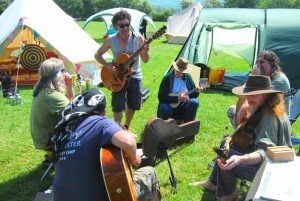 Every year the music is fantastic, with impromptu sessions as well as the main one on Saturday night around the camp fire. 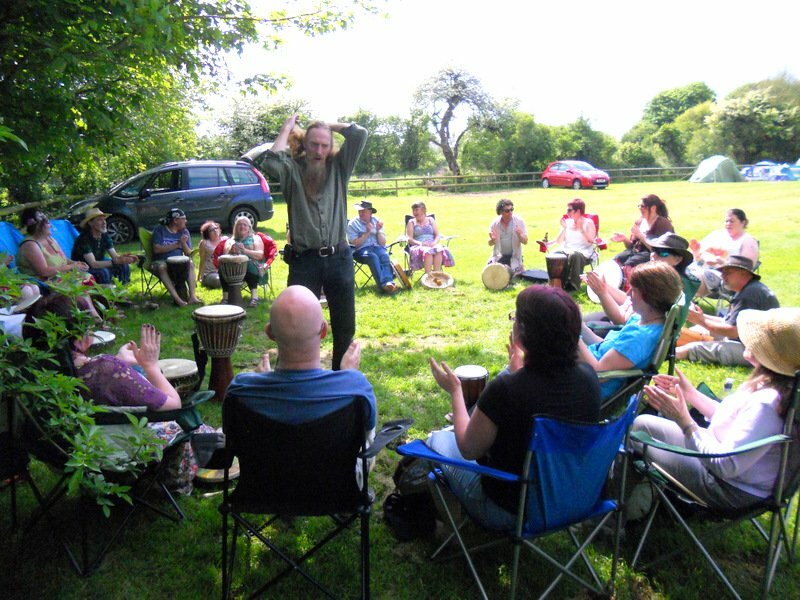 This year we were joined by story-teller Cliff Eastabrook who ran a drumming circle in the afternoon, and then entertained everyone with stories around the campfire. Mr B played his gong in a bell-tent (and I’m trying very hard to persuade him that we NEED a bell-tent of our own) and the whole camp was alive with music and song. 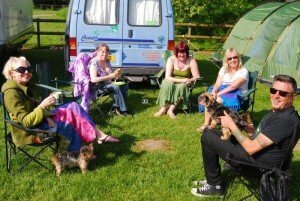 Next year’s dates have been booked already (always the weekend in the middle of May) as we’re lucky enough to have a whole paddock at the campsite just for Stonewylde. We have access to a barn and indoor barbeque area, in case the weather is bad, as well as permission to build a huge camp-fire. 2015 sees the Tenth Anniversary of publication of Magus of Stonewylde. Already there are plans afoot to make next year’s Moongazy Camp very special indeed. Many of this year’s people have already booked their places as Swampy will have to put a limit on how many can come. 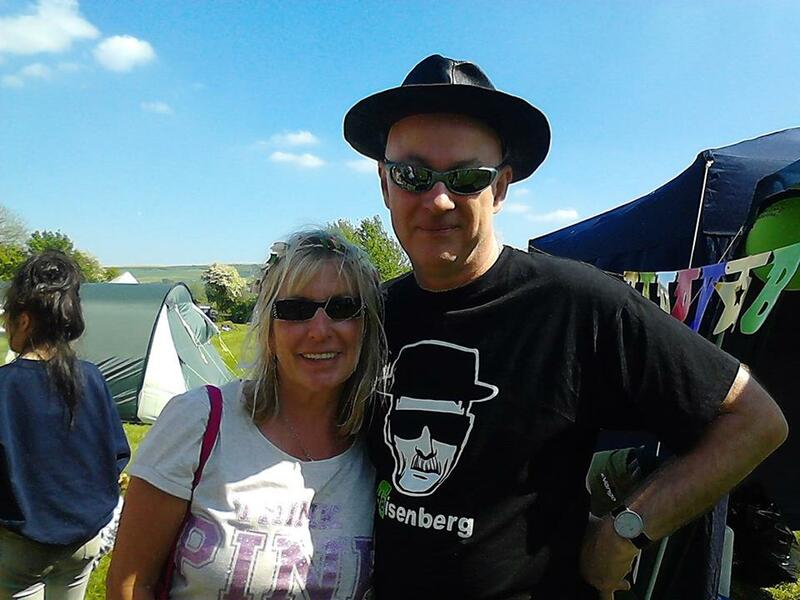 I feel so honoured, every year, that all these people get together and have such an amazing time because of my books. I stand there and gaze around and almost have to pinch myself. Funny to think that my publisher and bookshops place Stonewylde as teen reads – the teenagers at Moongazy Camp are there because their parents are such avid fans! I’m already excited about next year’s camp. 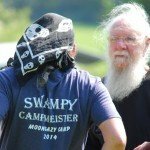 I’m very, very grateful to both Swampy for dedicating huge amounts of time and effort into making the camp such a success, and to all the wonderful Stonewylders for making it so special. The lady on the left is proud of her incredible Stonewylde tattoo, and has my signature permanently inked on her arm as well! 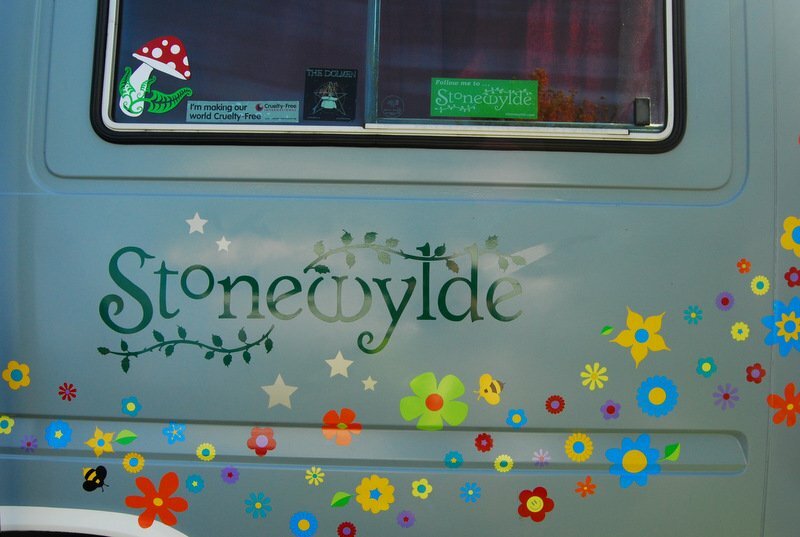 The camper-van below has been spotted around the country by many – a permanent advert for Stonewylde. This kind of loyalty is quite mind-blowing, and every year I return from Moongazy Camp feeling completely humbled by the dedication of my lovely readers. Beautifully put Kit! 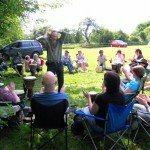 It was a wonderful weekend indeed – sunshine, laughter, fun, drumming, jamming, loving and sharing – all part of the friendly loving Stonewylde ethos. Thank you for bringing us all together in the first place. 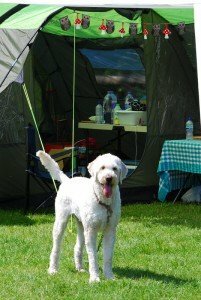 So many of us are tearful (with happiness) on arrival at camp and even more so on leaving. 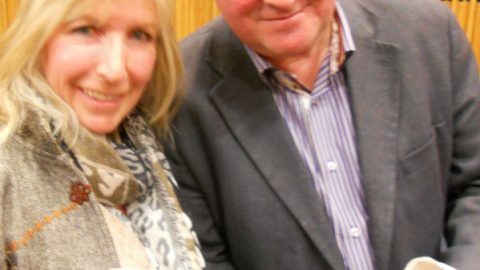 That made me laugh, Kay – everyone asks me too about the fhairy strands! 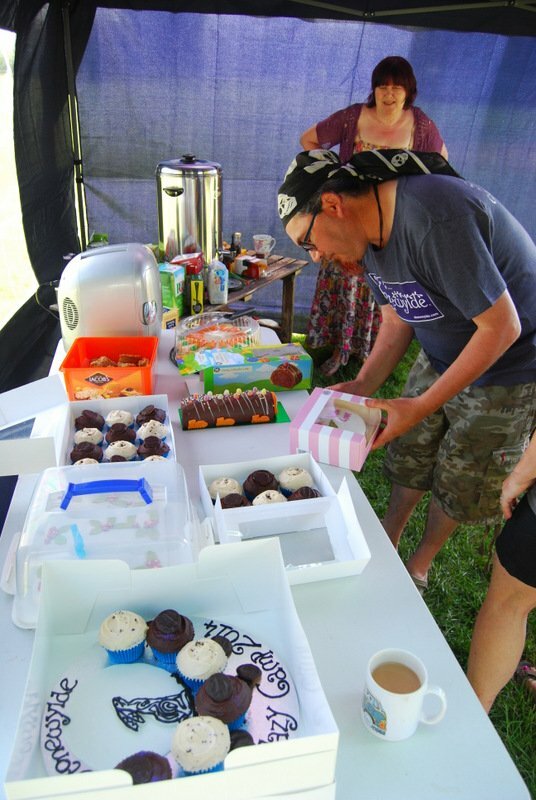 So glad you enjoyed your second camp, and I can’t thank your daughter enough for the amazing cakes and beautiful Moongazy decoration. See you all next year! A fantastic write up of what can only be described as the best Moongazy camp ever!!! Seeing all the happiness, love and laughter over the time at Moongazy is worth every minute spent on organising this event. Thank you Kit for your very kind words. Roll on 2015!!! Not sure I did you justice here, Swampy. You really were – and are – a star! 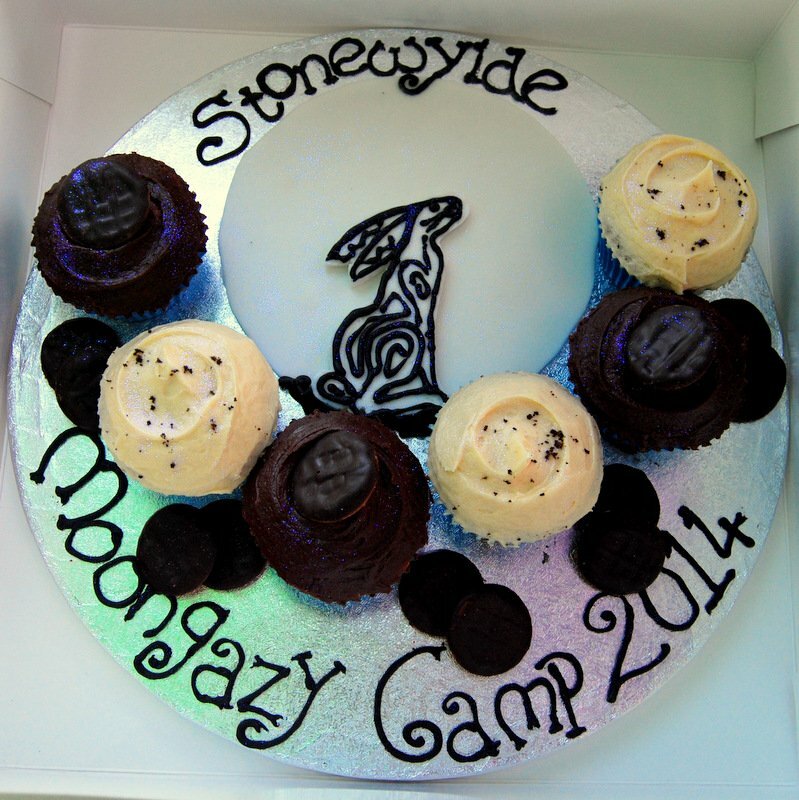 It was the best camp ever and I love meeting up again with all my Stonewylde family or should that be clan? Friendships have been forged which will last a lifetime. 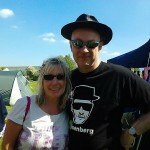 I too get asked about Fhairy strands and they have been commented on in both both Eastenders and Holby where I’ve been a supporting artist (extra). Kim has bell tent envy too. 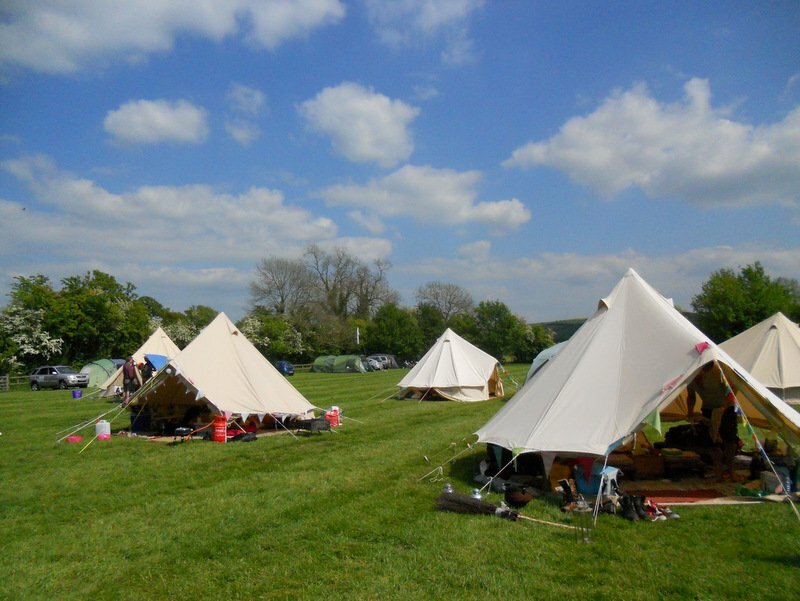 Bell tent envy – love it! I do find it strange that nobody uses a tipi – when I camped at the Wessex Gathering a few years ago, everyone seemed to have tipis. Your Marigold Balm is working wonders, by the way, on those insect bites! 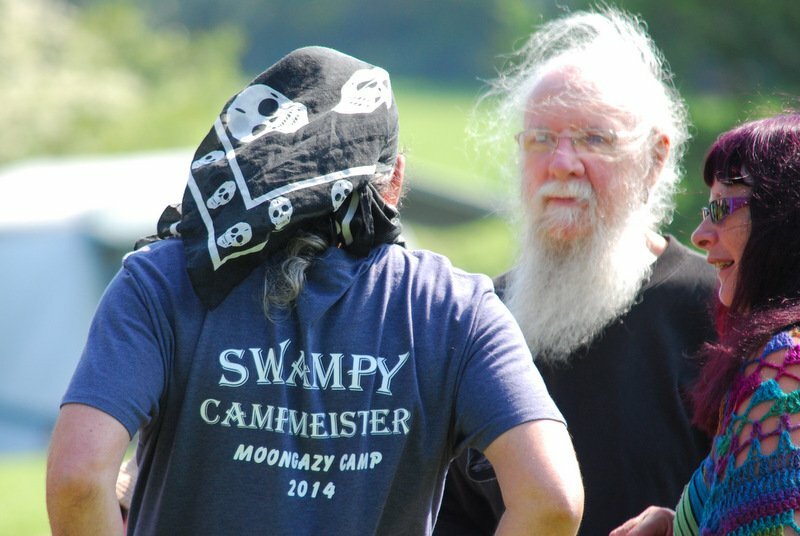 Absolutely – I hope we’re still taking part in Moongazy Camps when we’re very old crocks! I just wish it could be for longer, but I’m really going to try and stay a whole week next year. Indeed a most memorable weekend. I didn’t know what to expect, but I got far more warmth and friendship from it than I expected. Love and thanks to you all. 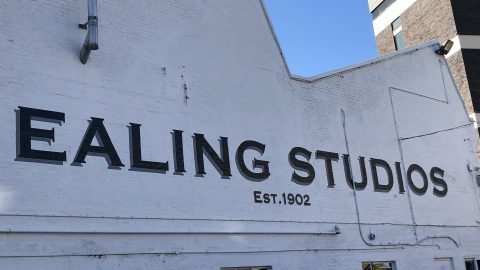 John, it was lovely to have you there! 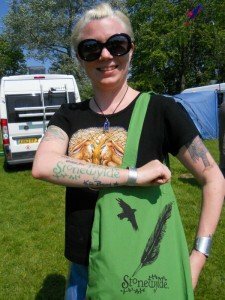 It’s a time of renewal of friendships for many of us, some of them going back to when Stonewylde was first published nearly nine years ago. But the Moongazy Camp is also a time to meet new people and form new friendships, and it was lovely to have a lot of new blood this year. I’m so glad you came, and look forward to seeing you again. oh Kit what a wonderful write up for such a wonderful camp. 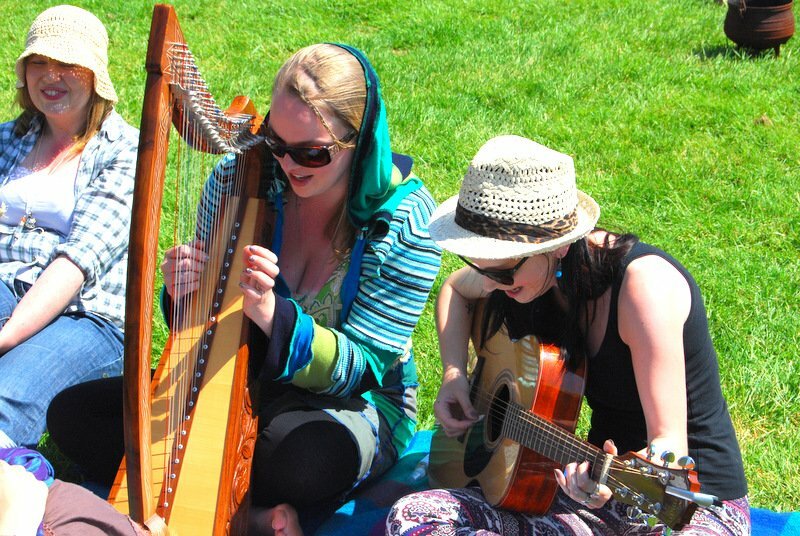 who knew that Stonewylde and a little meet up in Avebury would lead to this! Who indeed? 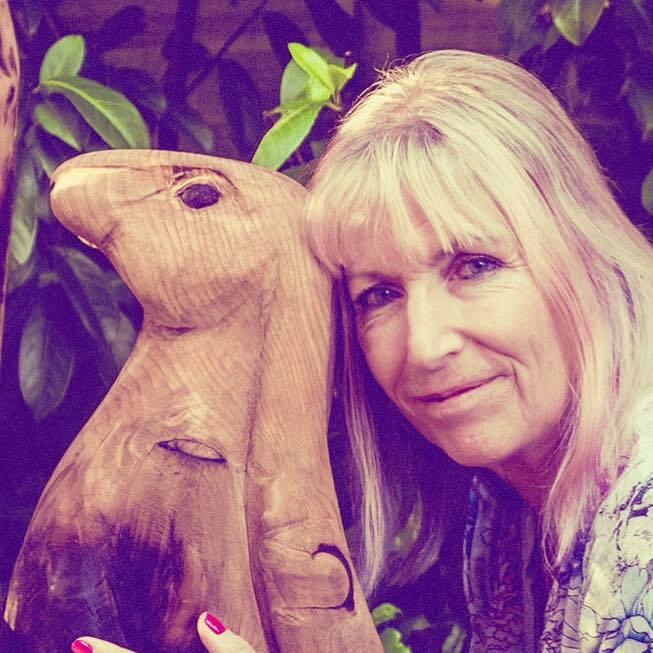 I really appreciate all that you do – just wish I’d seen your craft items which I somehow missed! And I never read the feature in that mag either! Next year I’m determined to stay for a whole week. Ah, that’s lovely! I feel the same, and still can’t quite believe the thing that we’ve all created together. Long may it last! 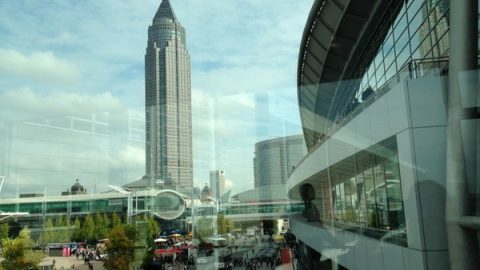 Brilliant – see you there next year! I know Swampy said he’s had many deposits in already – lots of places booked and it’s almost a year away! It was lovely to see you again – beautiful harp playing and I hope next year you and Crystal will play us some more, with your sister accompanying! Hard to get back into Muggledom, isn’t it?